WASHINGTON — Scott Pruitt is facing new and expanded ethics investigations for his handling of taxpayer dollars and possible perks he’s gotten as head of the Environmental Protection Agency. Staff for the Republican-led House Oversight committee confirmed Monday that it has expanded its review of Pruitt’s travel spending to now include ethical questions surrounding his bargain $50-a-night rental of a Capitol Hill condo tied to a fossil fuels lobbyist. The Office of Government Ethics also has issued a letter to EPA demanding documents related to the condo rental. And it reports that at least five agency officials faced retaliation after questioning Pruitt’s outsized spending for travel, unprecedented security precautions and pricey office furniture. Pruitt was at the White House on Monday for a cabinet meeting and was seated at the far end of the table from Trump. The president did not acknowledge Pruitt while reporters were present or address the ethical cloud swirling around his EPA chief. At the daily White House briefing, spokeswoman Sarah Huckabee Sanders was asked if Trump’s Saturday night tweet meant the president approved of his cabinet secretaries flying first-class and tripling the size of their security details. EPA Inspector General Arthur Elkins is now conducting at least five investigative audits related to Pruitt, including a previously undisclosed probe into questionable spending by his swollen security detail. The Associated Press reported Friday that the 20-member team tasked with providing day-and-night protection for Pruitt had racked up salary, overtime and travel expenses approaching $3 million. 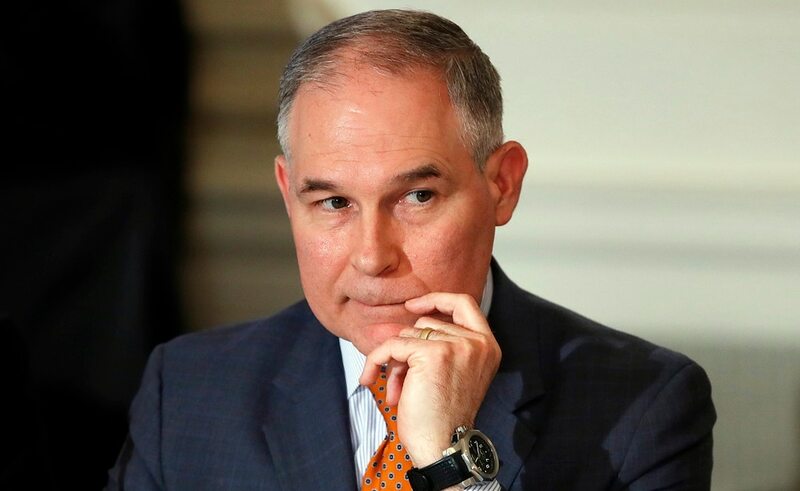 Jennifer Kaplan, the spokeswoman for the inspector general, also confirmed Monday that the internal watchdog has received multiple requests from members of Congress and the public for his office to examine whether Pruitt’s condo rental constituted an impermissible gift under federal ethic rules. A decision on whether to launch a new investigation into that issue is expected in coming days. The property, where Pruitt’s daughter also lived last summer while interning at the White House, is co-owned by the wife of the top executive at a powerhouse Washington lobbying firm with clients who have received favorable regulatory actions from EPA. Pruitt maintains the owner is a personal friend and that he paid a fair market rate, even though rentals nearby have advertised rates on more than twice what he paid. The broader probe launched by EPA’s inspector general into Pruitt’s security spending grew out of a 2016 audit into whether members of the administrator’s protective detail were improperly paid overtime wages. A separate investigation was launched in November into whether members of EPA’s internal law enforcement arm actually worked hours reflected on their timesheets. Elkins has also opened an audit into whether Pruitt improperly used authority granted under the Safe Drinking Water Act to provide massive raises to two of his closest aides. Pruitt denied knowing about the raises in a media interview last week, even though the statutory authority under which the raises were granted requires his approval. That’s on top of previously ongoing investigations into the administrator’s outsized travel spending and purchase of a $43,000 soundproof privacy booth purchased for the administrator to make private phone calls. Pruitt has cited security concerns as justification of his flying in first-class airline seats with his security chief, a perk not generally afforded to federal employees. However, on occasions when taxpayers weren’t paying for his ticket, Pruitt sat in coach on personal trips to attend college football games is his home state of Oklahoma. The Associated Press also reported that Pruitt sometimes flew on a companion pass obtained with the frequent flyer miles of Ken Wagner, a former law partner from Oklahoma that Pruitt hired to serve as a senior adviser at the EPA. Taxpayers still covered the airfare for the administrator’s security detail. Walter Shaub, who until last year ran the Office of Government Ethics, told the AP it was likely an ethics violation if Pruitt accepted the airline tickets, even if Wagner didn’t pay cash for them. Federal officials are barred from accepting gifts from employees that have a market value of more than $10. A nationwide search of state and federal court records by the AP found no case where anyone has been arrested or charged with threatening Pruitt. EPA’s press office did not respond Friday to provide details of any specific threats or arrests. Associated Press reporters Catherine Lucey and Ken Thomas contributed to this story.